Liven up any presentation or classroom! Buzz in with any android device or iPhone ! Now compete with up to 40 players in Monster QuizShow! "A Jeopardy Style Game Show Program"
"As Chief of Security and Public Safety for a major hospital, I needed a tool that would make training more interesting and fun my officers. Stimulate your students' interest level with this innovative classroom review game that is patterned after the Jeopardy TV version of the game. The Ultimate QuizShow is perfect for history, science, foreign languages, business, medical education, legal training or just for a break during your presentation or class instruction. Select 1 to 4 players (or split up into 2, 3 or 4 groups), start your projection system (or for those with a smaller group or 'budget' - turn the monitor toward your group), load the program, and you're ready to go. The twelfth major revision of software we have been developing for over 18 years, The Ultimate QuizShow allows the operator complete control in devising categories, answers and questions. It is ideal for any type of setting . . . a classroom . . . a business training setting, or just for family fun! The Ultimate QuizShow is for Windows-based computer systems. Support for wired PS2 Buzzers and wireless Buzzers. Support for up to 2 keyboards (we recommend the P.I. Engineering - Y-Key, Key Dual Keyboard Splitter available here. New with version 12.5 (January 2017) - Play with up to 40 Players ! ! Play either Regular Jeopardy-style game (4 players) or Monster Jeopardy-style game (up to 40 players). New with version 12.0 (November 2013) - Smart Phone Enabled ! ! Improved question and answer development. Improved graphics for many of the game screens! Enhanced video control for video files. Full Smart Board and Interactive White Board support. More flexible screen placement. Now the user may move the gameboard anywhere on their displays directly from the gameboard (no need to go to game setup screen). Use video files as answers ! Support for AVI, MPG and WMV video formats. Text can be added to graphic display, audio answers and video clips. During the Final Round, user can display the category of the Final Answer. Allows user to save game settings. Support for multiple monitors, by setting the location of the game screens. Automatically display correct response (ability for the user to turn this on or off). Winner is awarded with a little more glitz. Allows user to change team or player names. Allows user to record and save team or player names sound effects. Automatically keeps track of the last correct team or player. Fancier graphical displays . . . including the start of each round, scoreboard appearance, categories, etc. (more glitz - - same price). Access to game setup during the playing of the game. Secret wagers during the final round. Ability to toggle the White Board Marker-Box on or off. Display the answers and the questions ! ( you asked - we modified our software). "White board" capabilities. Write on the question or answer screen. Gamepad reset during the game. Support for up to 4 USB gamepads (all Windows 98 and later versions). Improved game screen look and feel (see actual screen shot above). Improved Windows XP installation interface. Once click license request using the internet. Support for different logos (beside The Ultimate QuizShow). Design your own logo and replace The Ultimate QuizShow logo with yours. Record and use your own sounds (or download sounds from the internet and use them). Improved question entering and editing. Support for longer category names (up to 20 characters). Sound effects variation, under the control of the instructor. 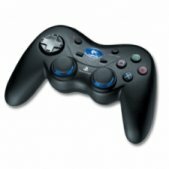 Gamepad support for all versions of Windows (Windows 98 and later). Support for up to 4 players (or teams). 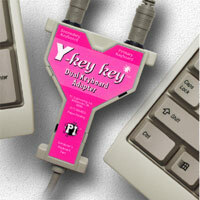 Support for up to 2 keyboards (with optional Y-key key Dual Keyboard adapter from PI Engineering available from TigerDirect.com). Support for up to 2 USB gamepads - recommended gamepad is Logitech USB WingMan (gamepad support is not available for Windows 2000 or Windows NT). Add pictures and sounds to the game's answer board.